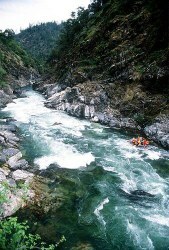 The California Salmon usually has runnable flows for whitewater rafting from April through mid-June. This river is free-flowing because it has no dams. Flows for whitewater rafting are dependent on the weather, snowpack and spring melt. Peek flows for rafting usually occur around the middle of May. The following river flow information is measured in cubic feet per second or cfs.